It was exactly 11 years ago today that I bid farewell to a 32 year career in public education. After I retired I continued to sub and even now I continue to get in the school to volunteer in my grand sons' classes as much as possible. It happens to be the same school where I taught. My grand sons finished kindergarten and first grade respectively. My grand daughters are headed into 4th grade and 6th grade respectively. As part of the year-end activities we got to go to Cole & Nicholas's authors's teas. We went to Brooke's end-of-year performances of two Shakespeare plays (That's right. Fifth graders doing Shakespeare! My fifth graders never did Shakespeare, that's for sure!). And Nicholas graduated from kindergarten. Courtney just finished third grade so she doesn't have graduations nor does her class apparently do Shakespeare but she does have a piano recital coming up so that's the next thing we have to look forward to. Time has a way of passing so much more quickly than we expect. It's amazing to me to think we no longer have preschool grand children. They're growing up so quickly but certainly there are no regrets. People grow up. It's as simple as that. The things we celebrate now are all good things and the things we're going to be celebrating in the future will be just as good. 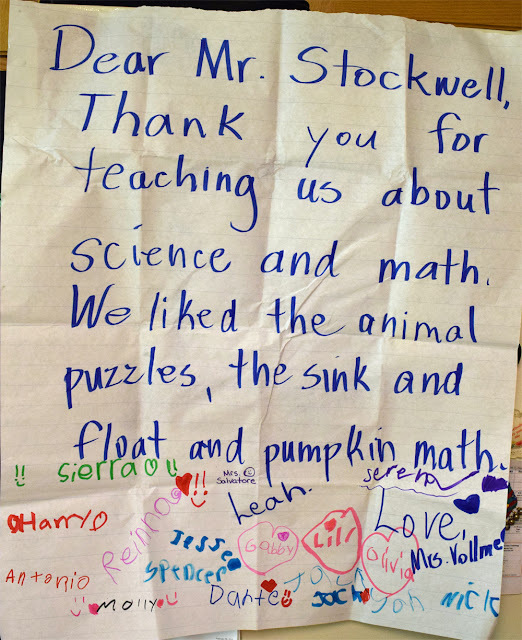 My younger grandson's class sent me the letter you see posted below. I hope to get many more similar to this as time goes on.